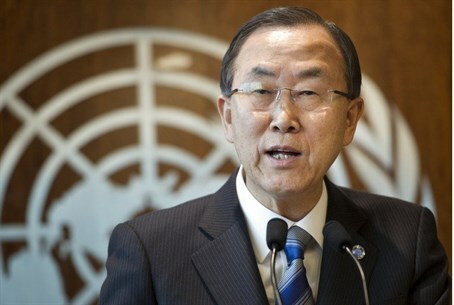 UN Secretary-General urges US, UK to give inspectors more time; Syria takes advantage of advanced warning to evacuate top military posts. The United States and Britain have come under pressure to delay military intervention in Syria, with United Nations Secretary-General Ban Ki-Moon urging both countries to hold fire. Earlier in the week senior U.S. officials said an attack on Syria could begin as early as Thursday, and a number of world leaders have voiced their support at the prospect of armed intervention even without UN backing. However, Ban’s announcement could leave America without British support for the immediate future, despite comments by the British Foreign Secretary that his country could join a unilateral operation. Britain’s Labour party has been urging the UK government not to attack in Syria without considering the results of the UN inspection. Meanwhile, Syrian President Bashar al-Assad and his government are preparing for an immediate strike regardless. The Syrian army has been evacuating key military and political facilities and has moved its army intelligence headquarters to an undercover center, according to Al Arabiya. Israelis are preparing for an attack in the near future, as well. The recent chemical attack, coupled with threats against Israel if the U.S. strikes in Syria, have led to a rush for gas masks.